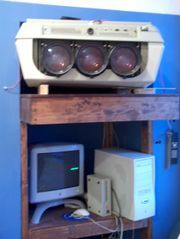 A large projector used to display images shown on a computer to the masses. All of the Barcos died in the 2007-2008 school year. The new NEC projector can be found mounted to the ceiling of the Goodale Lounge. Two of the three Barcos originated from a Reuse post in the summer of 2004. Eight Barcos from building two were posted for reuse - approximately six of the eight ended up in East Campus, two ending up on Slugfest. This page was last modified on 8 September 2015, at 22:59.